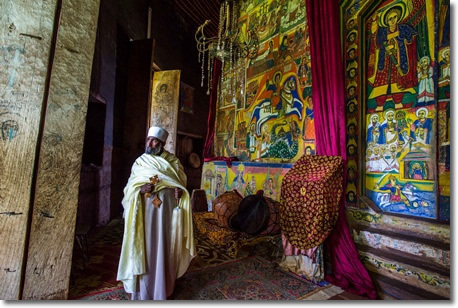 Monasteries of the Ethiopian Orthodox Church are places where monks isolate themselves from the world and dedicate to meditation and prayer. Currently, there are more than one thousand monasteries in various parts of Ethiopia. Few of them are found in and around Lake Tana. From about 37 islands of Lake Tana, twenty of them shelter churches and monasteries of immense cultural and historical interest. Some of them dated back to the 13th Century, and many others are dated from the 14th Century to the Gonderine period of the 17th and 18th centuries. Many of the original churches of Lake Tana are said to be renovated and reconstructed during the Gonderine period. Many of the churches and monasteries of Lake Tana are very famous cultural museums because of their beautiful mural paintings and many other valuable treasures such as varieties of crosses, crowns, costumes of kings, illuminated manuscripts, mummified bodies and remains of several Ethiopia Emperors in wooden coffins and glass boxes. In addition, they have been used as the major refugees for many cultural treasures of the country in general and the Ethiopian Orthodox Church in particular during the times of war and worst conditions in the history of the country like the devastating wars of Ahmed Gragn.